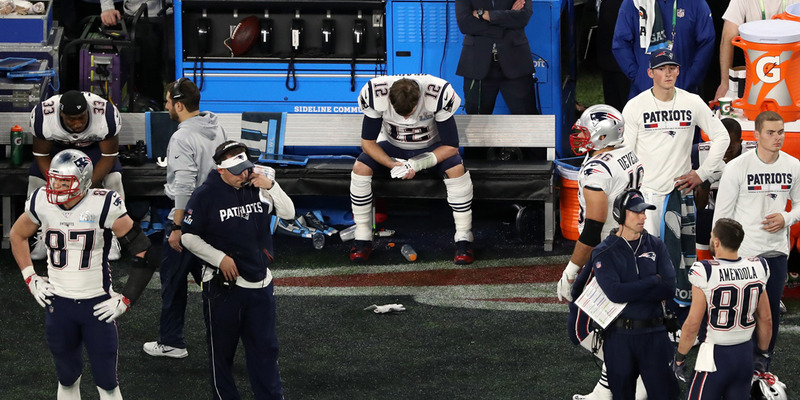 Christian Petersen/Getty ImagesTom Brady alone on the bench after fumbling the ball away in the final seconds of Super Bowl LII. Tom Brady’s documentary series, “Tom vs Time,” has been carried on Facebook and is set to air its final episode on Monday. In the lead up to the Super Bowl, Tom Brady could be seen in his documentary, “Tom vs Time,” on Facebook, which followed the ageing quarterback through the 2017 season. The series was scheduled for six episodes and gave fans an inside look at his life and the routine that keeps him playing at an MVP level at 40 years old, including his intense massages and obsessive football bookkeeping. Then the New England Patriots lost the Super Bowl. As of early March, only five episodes had aired, leaving many fans wondering when the series would conclude. It turned out, the final episode will air on Monday, and the reason for the delay is simple – the filmmakers needed a new ending as a result of the Super Bowl loss. As creator and director Gotham Chopra wrote in a note on Facebook, the series had an ending, but it included Brady climbing the mountain and winning yet another ring at the end of it – a goal the Patriots fell just short of achieving. Chopra insisted that he needed one final exit interview with Brady before he could end the series on the proper note, and as he wrote, he apparently got it back in February. Now, the series is set to finally conclude, with Brady addressing the Super Bowl loss, and how he used the disappointing ending as a teaching moment for his kids.